The Salomon Jib Academy from Mont Tremblant will be featured on an upcoming Ride Guide episode on OLN Canada, on Sunday, March 8, 2009 at 11:30 am Eastern. 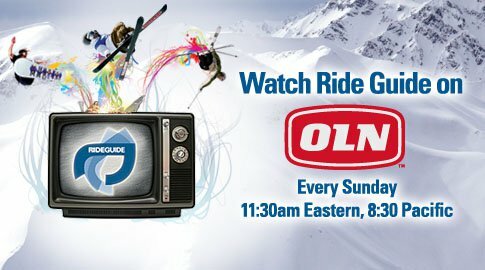 Ride Guide TV, North America&rsquo;s premier ski, snowboard and mountain bike television series, launched on OLN Canada on January 18, 2009 for a 52 week schedule. For the next year, Ride Guide&rsquo;s viewers can watch new content from the 2008 and 2009 seasons, every Sundays at 11:30 am Eastern (8:30 am Pacific). Throughout Spring 2009, Ride Guide fans can see fresh content from Ride Guide&rsquo;s 2008 Bike season, Summer 2009, episodes from Ride Guide Snow 2009, and Fall 2009, Ride Guide episodes from the Bike 2009 season. Ride Guide is a mountain travel TV series, where the hosts and guest pros, share their travels of skiing, snowboarding and mountain biking from locations throughout the world. Ride Guide is also available on Rush HD Canada, every Sunday at 8 pm Eastern. Ride Guide is carried also on Men TV, Shaw Video On Demand, and Rogers On Demand. Ride Guide can be seen exclusively throughout the USA on The Ski Channel. Check out details on the Ride Guide schedule at http://www.rideguide.ca. Newschoolers guide to the best offerings of 2018 - 2019 skis. Snow is going to fall in places in the countries that are the United States & Canada. Here are the predictions for them.